Last month Mr Bruton said in London that the Rising damaged the Irish psyche. The other day he said it was “completely unnecessary” and that any State commemorations of the Rising should not “retrospectively justify violence”. The basis for Mr Bruton’s argument is his claim that the placing of Home Rule “on the statute book” by the British government in September 1914 was enough to make the Rising and the struggle for Irish independence superfluous. If only our ancestors had the wisdom and insight of Mr Bruton; if only he had been there to tell them the error of their ways. Mar eadh. Mr Bruton thinks Home Rule “on the statute book” was so great an event that the Irish Government should commemorate it next month. So let us examine exactly what happened in Westminster in September 1914. The Home Rule Bill, providing for an extremely limited form of devolution for Ireland, within the UK and British Empire, was at its final stage. Against this bill, the British opposition Conservative and Unionist Party waged an unrelenting campaign. The Tories had seized on the issue of Home Rule as the most effective weapon to use against the Liberals. Leading members of the British landed aristocracy and senior military figures avidly supported threats of civil war if Home Rule was implemented. This culminated in the arming of the Ulster Volunteer Force and the anti-Home Rule mutiny by British army officers at the Curragh. Under that pressure, the Liberal government and John Redmond agreed in principle that Ireland should be partitioned rather than have North-East Ulster included under Home Rule. In September 1914, with the war just weeks old, the Liberal government pulled one of the greatest strokes ever attempted by a British government. It enacted the Home Rule Bill but suspended it until the end of the war when an amending bill would be passed to provide for partition. In return for this, John Redmond pledged the lives of tens of thousands of young Irishmen to the British war effort and embarked on a recruiting campaign for the army. Roger Casement described Home Rule “on the statute book” as “a promissory note payable only after death”. James Connolly called it “a carefully staged pantomime to fool nationalist Ireland” and said that, in return, Redmond’s party would “send forth more thousands of Irish men and boys to manure with their corpses the soil of a foreign country”. Connolly and Casement were correct in their prediction. It is estimated that well over 30,000 Irishmen died in the First World War. The exact number will never be known. A great number of them were induced to join up by Redmond’s promise of Home Rule for Ireland and by Edward Carson’s promise of no Home Rule for Ulster. Isn’t it strange then that Mr Bruton is so worried that honouring the men and women of Easter 1916 would retrospectively justify violence when he has nothing to say about the role of Redmond and his party in sending tens of thousands of Irishmen to fight Germans and Austrians and Turks with whom Ireland had no quarrel? Was John Redmond not a man of violence? It is hugely important that we remember these events as a nation on our own terms. It is right that those Irish people who died in the First World War and those who survived it should be remembered. Their families have every right to honour their courage. But this does not mean ignoring the fact that Ireland, as a submerged nation within the UK, was carried into the war without any say in the matter. We should look at the war from an Irish point of view. It was a war of empires ruled by privileged elites who cared little for the lives of the millions they threw into battle. The Irish experience of the war up to 1916 was one of the factors that led to the Easter Rising. 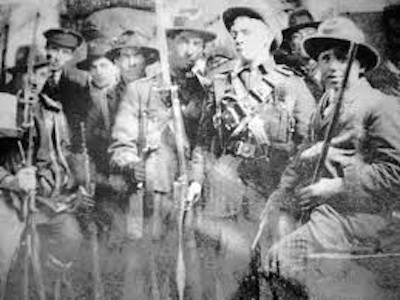 And after the Rising and the executions and repression that followed, many Irishmen who had fought in the British army rejected that army for good. Some of them joined the IRA. The notion that Britain had fought “for the freedom of small nations” was exposed as hypocrisy when Britain refused to recognise the First Dail Eireann. Mr Bruton does no service to the memory of the Irish dead of World War One by denigrating the men and women of Easter 1916. I suspect that behind Mr Bruton’s Redmondite crusade is a fear, not of violence, but of the Proclamation. You see, the Proclamation enshrines principles and commitments to equality and Irish sovereignty that still challenge the privileged in our society. It is a commitment to a rights-based society in Ireland with equality for all our citizens. That is why the Proclamation should be at the centre of all our celebrations and commemorations of the great national and international event that was the 1916 Easter Rising.